I order a personalized ornament every year for my son's family. I always order from Mike's Kimball because the variety of choices is wonderful and items are always beautiful and far exceed my expectations. I will order again next year. I am very happy with the ornaments I ordered. They are great. I will diffidently order next year! 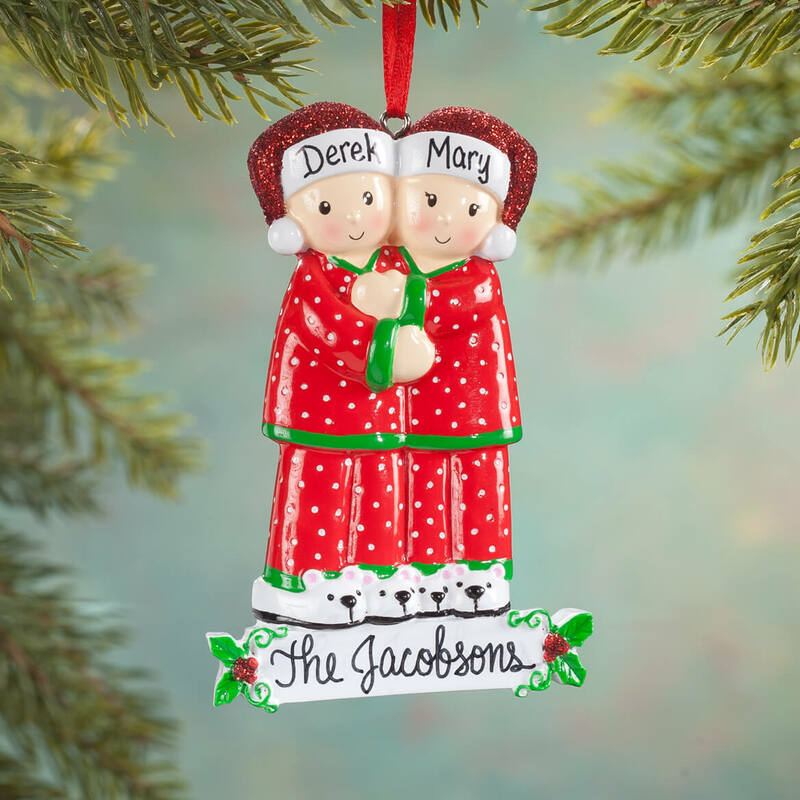 This is a very cute ornament and one of the few you can get with six names on it. Well worth the money. It also came quickly. Such a beautiful personalized ornament to treasure for years to come. I would purchase this item for other family members. I have a newly married son and this ornament shows love between the two. This is a cute design of parents and little girls. For my daughter and her family. Still waiting on the product. Looks nice, which is why I bought it. Needed a special family ornament. This gives you a large number of names to choose from. Perfect for the growing family. We try every year to personalize our tree ornaments. We try to buy a brass ornament, but we had trouble finding a variety for this year. I just loved the pj's, and little bear. I like giving Christmas Tree ornaments to friends and family because they will remember from year to year who gave it to them. the family is growing and lasting memories are what we need to remember the spirit of Christmas. Needed for patio table. It fit my table perfect. This will also protect my table from the weather. it is gifts for my friends and family. Every year tradition. So cute! Great to be able to Personalize for a family of 6! I buy a personalized ornament every year from Miles Kimball. 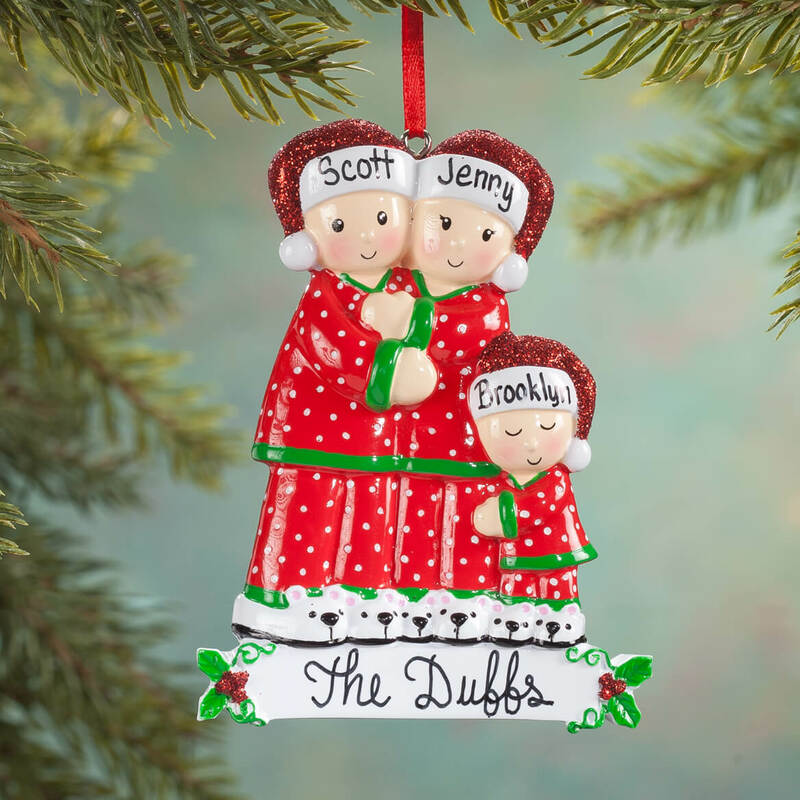 Their ornaments are very popular as this is the 3rd one ordered this year as the first two options were out of stock. I have bought new matching pajamas for myself and my now New Daughter-In-Law for years. 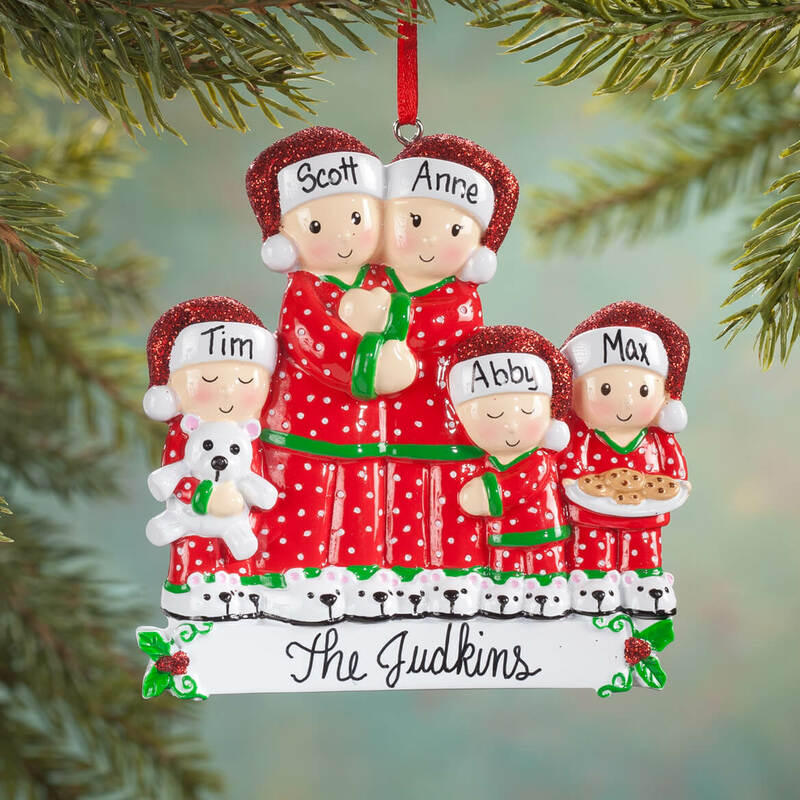 When I saw this ornament I thought it was a way to say officially "Welcome To The Family" because I listed the Whole Family on it even down to our 2 Sweet Fur Babies! I like the style of this ornament. So cute and I know our granddaughter and her family will love it! 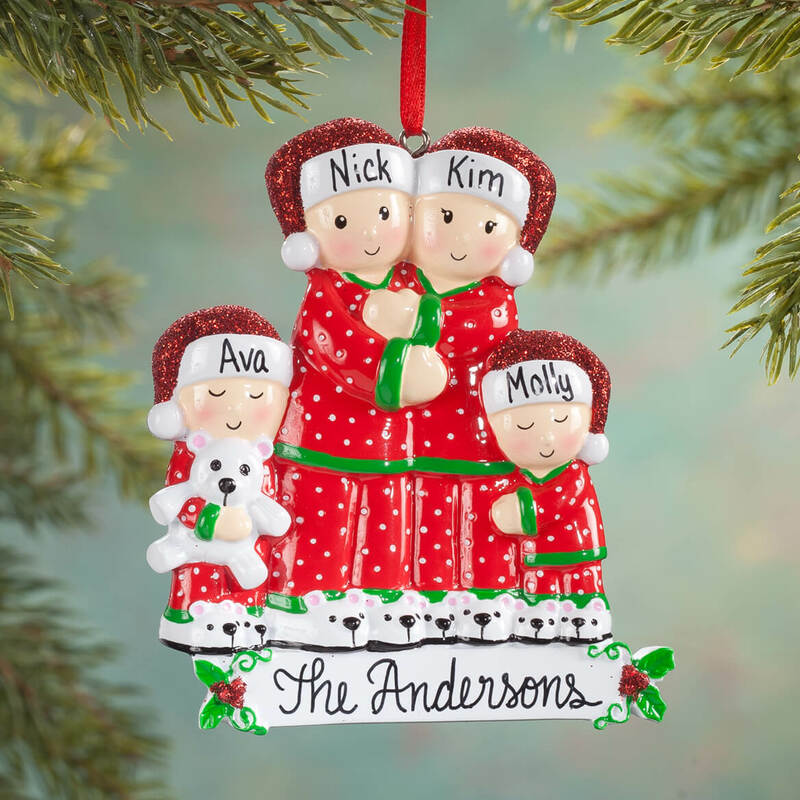 Cute PJ family for a family who loves family ornaments. Wanted a cute ornament showing mom, dad & child...this was perfect! was cancelled. thought it would b=have been cute for a family of 4. Loved the snowmen. I buy my son and family a personalized ornament every year. 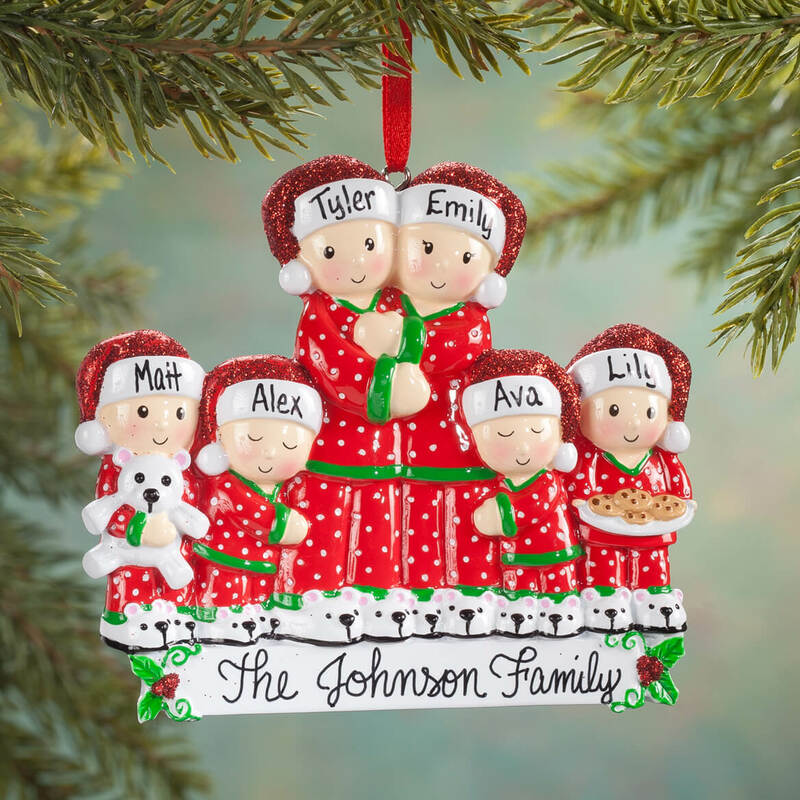 It's rare to find an ornament you can personalize with 6 names. 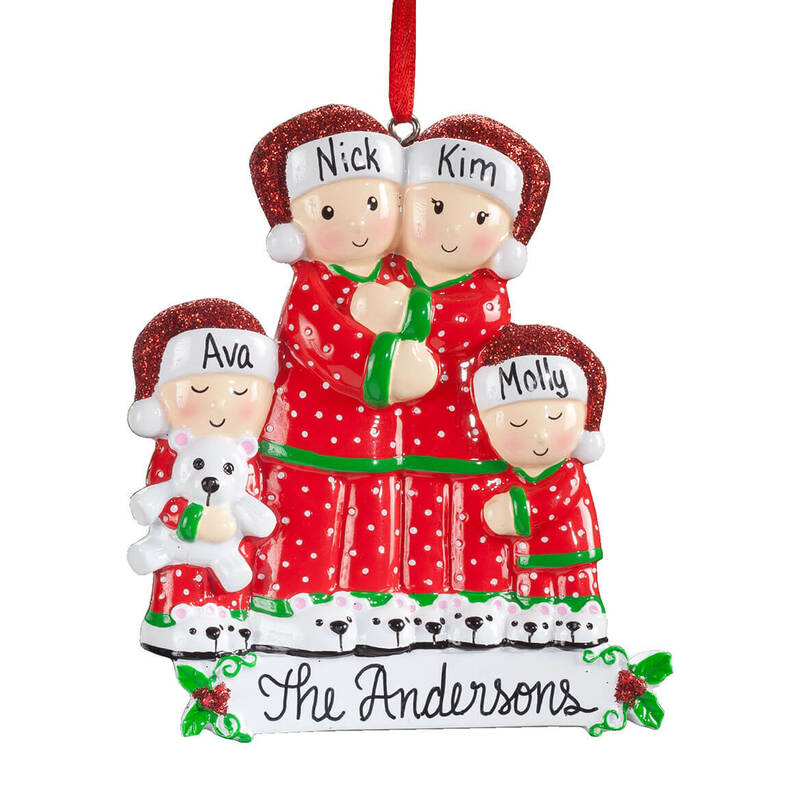 Very cute ornament for my granddaughter and her little family. She will love it! What number is the adults? BEST ANSWER: Thank you for your question. We have updated the item on our website and it now asks for Mom and Dad names. We hope this information will be of help to you. I need an ornament with just mom and child... how do I go about that? BEST ANSWER: Thank you for your question. We do not sell a product with just mother and child. We hope this information will be of help to you. What is the difference between plain family and family? BEST ANSWER: Thank you for your question. Plain will be non personalized and family will be personalized. We hope this information will be of help to you. Hi Tamye, i'm not quite sure what the difference is either; unless it means u can get just the plain family not personalized. Sorry I couldn't be more helpful.